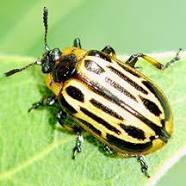 The cottonwood leaf beetle (Chrysomela scripta) is a native species going through a population spike. Spikes usually last for a growing season, and this one is lasting for two which is not a cause for alarm, i.e., it’s not a plague. Populations normally revert to normal levels without intervention. Damage to established trees usually looks worse than it actually is. Nursery stock during the establishment period is vulnerable. Boulder County doesn’t treat the CLB because it is native, but there are methods that can be used. The most effective chemicals should not be used near water so are not options at LHC. Alternatives would be natural pyrethrins (derived from chrysanthemums), spinosad, and Bacillus thuringiensis (the mention of these treatments is not a recommendation; it is for discussion only). All of these would have to be timed to target the larval stage, and although this insect has 2-4 generations in a season, by the time we notice the damage the population has peaked.